Today, we are thrilled to bring you the first part of our two-part interview with Vessel author Sarah Beth Durst. 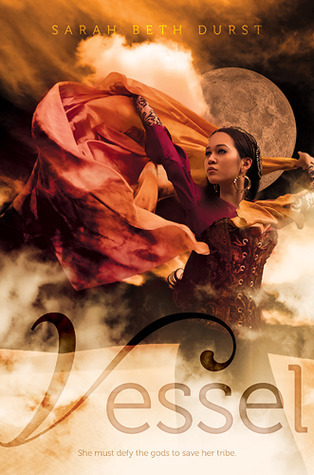 VESSEL is such a breathtaking novel — I was completely swept up in the world, the romance, the characters, the setting … how did the novel come together for you? What came first, and what followed? I knew I wanted to write about a desert. A few years ago, I’d written about the Arctic (in my polar bear fantasy novel ICE), and this time, I wanted to write about the sun and the heat. But the story didn’t come together until I had the idea for Liyana, a girl who is destined to sacrifice herself so that her goddess can inhabit her body and save her clan. She started as a single image: a girl dancing barefoot on the desert sand. For me, stories don’t come as massive lightning bolts out of the blue. They come as sparks — lots of little ideas — that coalesce together to form a flame. The opening chapter of VESSEL is really gut-wrenching. The emotion of willingly sacrificing one’s body for the greater good is so charged. Just reading about Liyana’s struggle made me tear up. What was it like writing such an emotionally charged passage? I cried when I wrote the scene when Liyana says goodbye to her four-year-old brother. Were the society or the gods in VESSEL inspired by anything? How did you develop the mythology of your world? I love mythology, and I’ve read a ton of it. So I’d have to say that the mythology of VESSEL was inspired by pretty much all the mythology that I know! I tried to create a lore that felt rich and ancient by drawing on the rhythm of the stories, the universal themes, and the archetypes that pervade various cultures. Only one god was directly inspired by existing mythology: Korbyn. He’s a trickster god. When Liyana first meets him, he offers to save her life, and she offers to skewer him. VESSEL very much plays with the idea of destiny versus free choice. Talk a little bit about the interplay of these themes throughout the novel. VESSEL is about what happens after you lose your destiny. Liyana doesn’t want to die, but she’s willing to accept her fate if it means saving her family, especially her beloved baby brother… and then that choice is taken from her. She has to shape her own future when she never expected to have one.